The Sun’s impact on weather here on Earth is clear: It makes it hot or cold, it powers air currents, it causes water to evaporate making rain, et cetera. But with our increasing reliance on satellites and electronics, you can’t forget its more insidious effects—and some satellites got a taste of those yesterday. 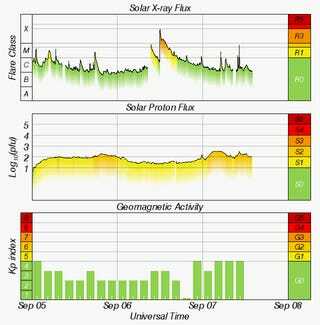 Around 5:10 and 8:00AM eastern time, the Sun let out a hiccup and then a loud belch—the largest solar flare in twelve years. These large events are typically harmless to those on the ground, but this one could have potentially disrupted GPS communication yesterday morning. 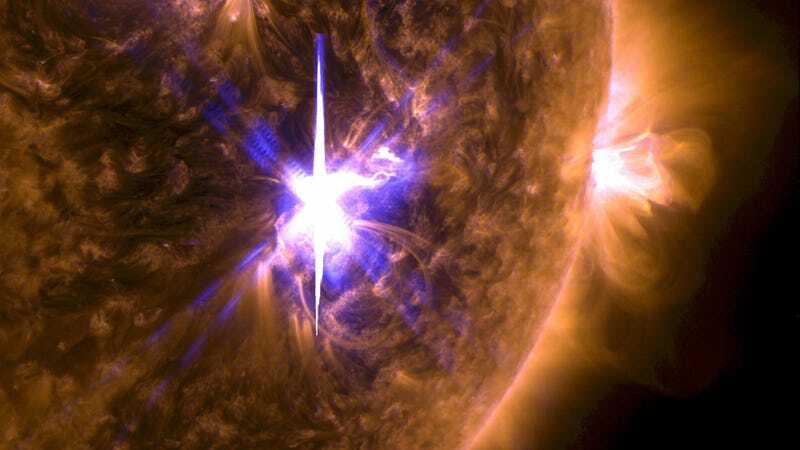 The flares came from part of the sun called AR 2673, according to a NASA press release. 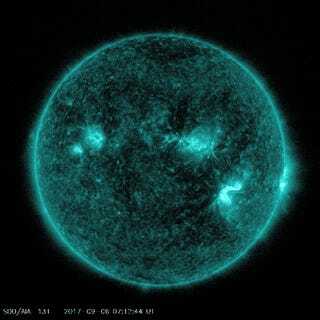 Solar flares probably occur as a result of the Sun’s magnetic field changing shape in these more magnetically-active regions, creating a blast of energy and sending tiny charged particles streaming into space. The two flares fell into the X class of most powerful events, one registering an X2.2 (2.2 times as intense as the weakest X-class flare) and the second registering an X9.3 (9.3 times as intense). This second flare was the largest since 2005, and the eighth-largest on record. These flares come as the Sun is weakening in its 11 year cycle, and X9.3 is especially intense as solar activity approaches its minimum. According to reporting by New Scientist, the storm temporarily disrupted GPS and radio communications. I have a hunch that it also disrupted the National Oceanic and Atmospheric Administration’s tool that measures Earth’s magnetic activity, though I’ve emailed NOAA to confirm. Here’s what those two flares looked like (check out the top plot). NOAA’s space weather site also predicts a potential aurora visible as far south as Seattle and Chicago over the weekend as a result of the storm. Space weather isn’t something you necessarily need to worry about, but it’s definitely something engineers and anyone involved with electronics needs to consider. Particles from a solar storm once interfered with a voting machine in a 2003 Belgian election, swapping 4096 votes (not enough to pick the wrong candidate, though). A big enough event has the capability of causing massive power outages, though. And if you’re interested, you can whip out those solar eclipse glasses to spot the sunspots that caused the event. Maybe this event wasn’t so bad—after all, you’re still reading this article. But who knows what will happen when the next big one hits.